Get June Lake maps and directions from MapQuest here. June Lake is centrally located on the eastern slope of the majestic Sierra Nevada mountains. California State Route 158 defines the June Lake Loop Road, which joins US Highway 395 at two points, north and south. Also in confluence with the North Junction is State Route 120 which extends from central Nevada to the east and Yosemite National Park to the west. Portions of S/R120 are closed in winter. Northern California/Northern Nevada/Other Northern Points: use Interstate 80 or US 395 to Reno, or US 50 to the Tahoe area. Access US 395 and proceed South. Reno: the June Lake Loop is 150 miles south via US 395. Central California: During summer weather use State Route 120 east (Tioga Pass) to cross the sierra crest (there is a $20 fee to travel through Yosemite National Park). Route 108, Sonora Pass, may also be recommended. Upon access to US 395 turn right (south). 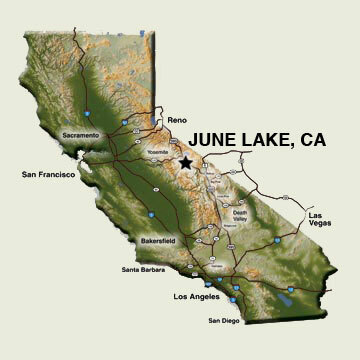 June Lake is about 175 miles from the Stockton-Manteca area. During the winter months these mountain passes are closed, so you'll need to use Route 88, Carson Pass. Fre sno area: Use State Route 41 north through Oakhurst and Wawona to meet the Route 120 inside Yosemite National Park. In Winter use the Bakersfield route. Bakersfield: Take California Route 58 East (Tehachapi Pass) to Mojave, then follow California 14 North to the Junction of US 395 at Inyokern. Nevada/Yerington: Use Nevada 208 to 338 south, meeting California 182 to US 395 at Bridgeport; or take US 95 South to Hawthorne then Nevada 359 which meets California Route 167 to reach US 395 at Mono Lake. Wendover-All Points East: Take Alt.93 through Ely then US 6 to Tonopah. Tonopah: Follow US 6 West over Montgomery Pass which meets California Route 120 at Benton. In winter you will need to follow US 6 to US 395 at Bishop and then turn North. Las Vegas: Follow 95 north to the 266 through Lida, then take Route 168 at Oasis over Westgard Pass to meet US 395 at Big Pine. Turn North. Approximatly five to six hours total driving time. Longer alternative routes include crossing through Death Valley to Lone Pine via Route 190, or through Barstow on Route 58 to Mojave then north. Mojave is 230 miles from June Lake. Southern California San Diego-Orange County-Inland Empire: Follow I-15 North over Cajon Pass to meet the US 395 North near Adelanto. Southern California Coastal-Los Angeles-Santa Barbara: From the I-5 at Sylmar take California 14 North to the junction of US 395 at Inyokern Most Southern California Destinations are 300-500 miles from June Lake.